The South China Sea is a critical commercial gateway for a significant portion of the world’s merchant shipping, and hence is an important economic and strategic sub-region of the Indo-Pacific. It is also the site of several complex territorial disputes that have been the cause of conflict and tension within the region and throughout the Indo-Pacific. Geographically, the South China Sea plays a significant role in the geopolitics of the Indo-Pacific. The South China Sea is bordered by Brunei, Cambodia, China, Indonesia, Malaysia, the Philippines Singapore, Taiwan, Thailand and Vietnam. Their recent economic growth has contributed to a large portion of the world’s commercial merchant shipping passing through these waters. Japan and South Korea rely heavily on the South China Sea for their supply of fuels and raw materials and as an export route, although the availability of diversionary sea lanes bypassing the South China Sea provides non-littoral states with some flexibility in this regard. The South China Sea also contains rich, though unregulated and over-exploited fishing grounds and is reported to hold significant reserves of undiscovered oil and gas, which is an aggravating factor in maritime and territorial disputes. The major island and reef formations in the South China Sea are the Spratly Islands, Paracel Islands, Pratas, the Natuna Islands and Scarborough Shoal. Competing claims of territorial sovereignty over islands and smaller features in the South China Sea have been a longstanding source of tension and distrust in the region. The United Nations Convention on the Law of the Sea (UNCLOS), which was concluded in 1982 and came into force in 1994, established a legal framework intended to balance the economic and security interests of coastal states with those of seafaring nations. UNCLOS enshrines the Exclusive Economic Zone (EEZ), a 200 nautical mile area that extends sole exploitation rights to coastal nations over marine resources. However, the EEZ was never intended to serve as a security zone, and UNCLOS also guarantees wide-ranging passage rights for naval vessels and military aircraft. While UNCLOS has been signed and ratified by nearly all the coastal countries in the South China Sea, its interpretation is still hotly disputed. Moreover, legal and territorial disputes persist, primarily over the Spratly and Paracel Islands as well as Scarborough Shoal, the scene of ongoing tensions between China and the Philippines. 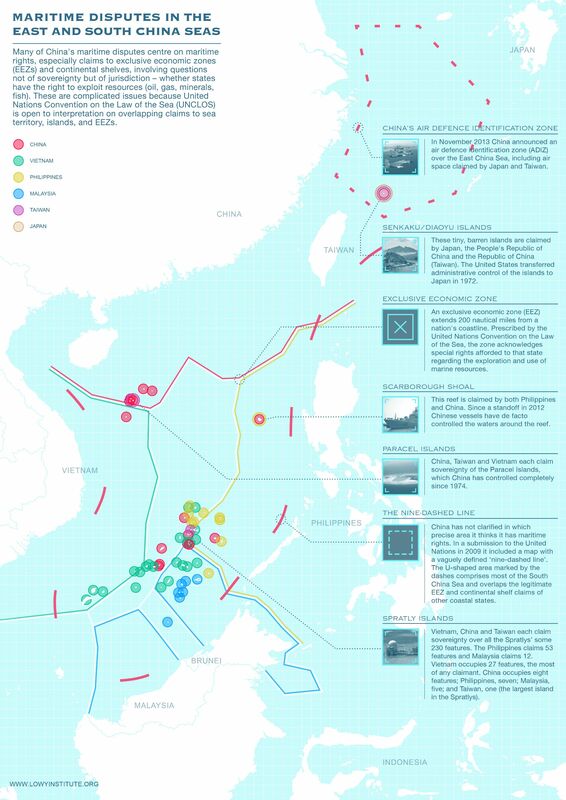 In terms of the Spratlys, more than 60 geographic features are reportedly occupied by claimants, which consist of Taiwan, Vietnam, the Philippines, China and Malaysia. The Paracel Islands are the subject of overlapping claims by China, Vietnam and Taiwan. China makes the largest claim in the South China Sea, within a ‘dash-line’ map published by the Kuomintang Government in 1947. The ambiguous nine or ten ‘dash line’, which China asserts is based on evidence of historical usage, is disputed by other South China Sea territorial claimants and lacks a legal foundation under UNCLOS. Australia has significant interests in the South China Sea, both economically, in terms of freedom of trade and navigation, and geopolitically, as the United States is invested in upholding the rules-based order in the region. Australia has been conducting its own airborne surveillance operations in the South China Sea and Indian Ocean, called Operation Gateway, since 1980. These patrols are conducted by P-3 Orion maritime aircraft and some of them have been verbally challenged by China. While Australia has not conducted a surface FONOP operation similar to those of the US Navy, it regularly conducts naval presence patrols, exercises and port calls throughout the region. As Washington’s closest ally in the region, Australia may come under growing pressure from the United States to make its presence felt in the South China Sea beyond statements of diplomatic support for freedom of navigation. The Lowy Institute has a strong record of analysis, commentary and research on issues pertaining to the South China Sea, particularly concerning territorial disputes and maritime security. This research has largely been conducted through both the International Security and East Asia Programs. Can Boris Johnson deliver on his colossal naval expectations? Vietnam's recent request to India to play a more prominent role in Southeast Asia and the South China Sea did not come as a total surprise. It's not the first time Vietnam has asked a nation with no direct interest in the area for backing – it made a similar call to South Korea a few months ago. The Hague Tribunal's South China Sea ruling: empty provocation or slow-burning influence? The South China Sea: Next Stop the UN Security Council?